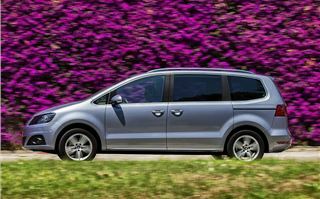 Say hello to the revised SEAT Alhambra. No, really, it has been revised - but you could be forgiven for thinking otherwise. Cosmetically the tweaks are barely noticeable - there is a new grille and some new lights, front and rear. Thankfully the team at SEAT has done a little more underneath the metal, with up-to-date, cleaner engines and new technology. There's a choice between a 2.0-litre TDI diesel with either 150PS or 184PS, or there is a 1.4-litre TSI petrol with 150PS. All three variants are available with the choice of a six-speed manual or a six-speed DSG dual-clutch automatic transmission - and there is very little between the gearboxes when it comes to emissions and economy. We drove the most frugal and most popular 150PS diesel. This has official economy of 56.5mpg and emissions of 130g/km if you go for a basic S model with an easy to use manual transmission. Economy drops to 54.3mpg and emissions rise to 136g/km if you opt for the DSG auto, but it’s a small penalty for the added convenience - it makes the Alhambra pretty much effortless to drive, thanks in part thanks to a flexible 340Nm torque output from 1750rpm. You do notice the size of the car in town, but on an A-road or a motorway it doesn’t feel any less wieldy than a family saloon. Refinement is good, with little noise intruding into the cabin, plus the suspension does a good job of absorbing lumps and bumps comfortably. There are now optional adaptive dampers to stiffen or soften the ride quality at the touch of a button - but you have to question why on a car like this. 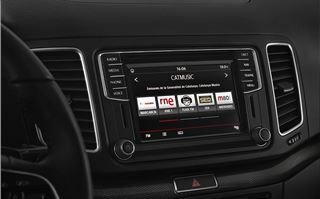 Thankfully the rest of the technology makes more sense - the Alhambra comes with SEAT’s latest touchscreen system as standard, which incorporates newly-developed phone connectivity. With most modern phones, after a little bit of setting up, you simply plug in and then everything important appears on the screen. 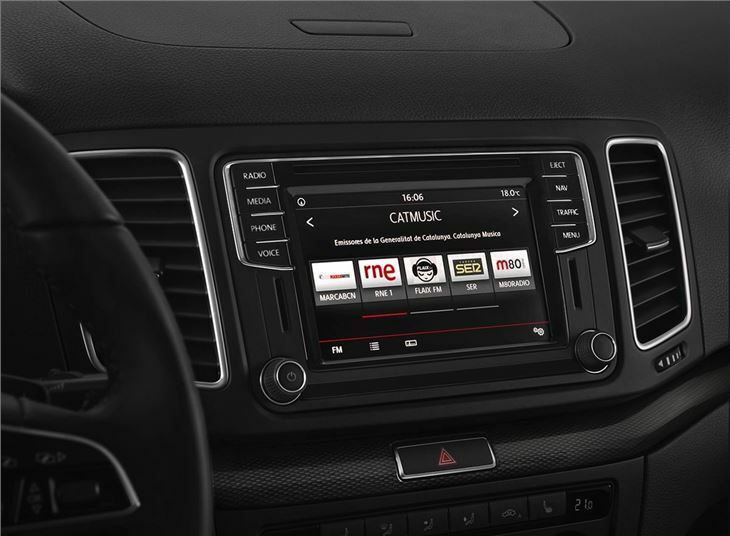 It reads messages or tweets and gives you access to music streaming, as well as hands free calls. There are a few other changes in the cabin, including a redesigned instrument cluster, but generally it’s very similar to before. 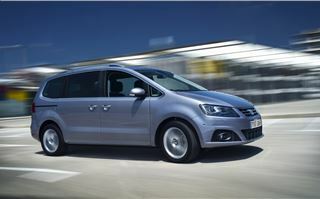 That isn’t a bad thing though - the Alhambra is one of the most user-friendly and spacious MPVs on sale. There are sliding rear doors, giving good access to the middle row. 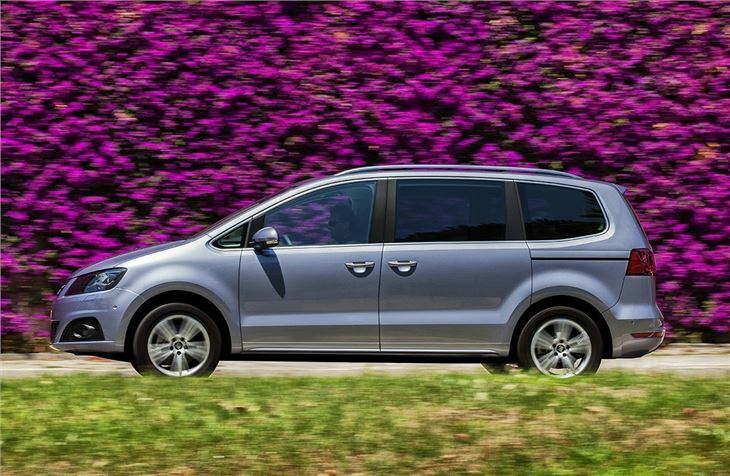 Here the seats are adult-friendly and easily adjustable, plus there is good visibility both forwards and out of the side windows. There are seven seats, of course, though the rearmost seats are a little tight for adults. Children will be happy once they’ve clambered in though. 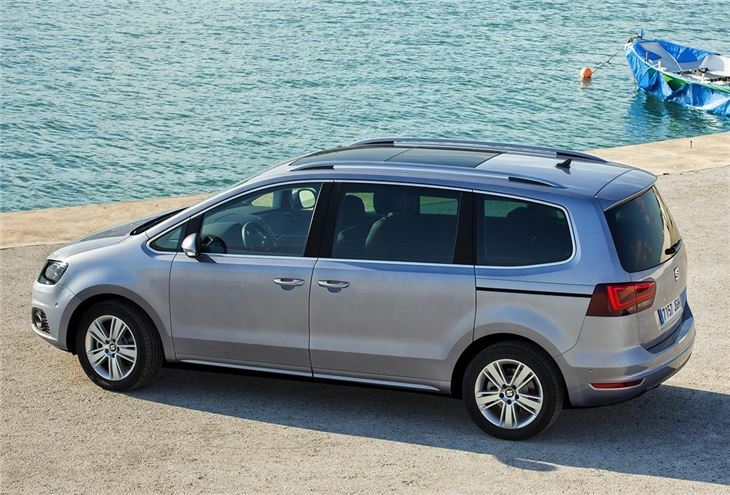 Folding and unfolding the rear seats is very easy and it’s the same story with the middle row, meaning it’s straightforward to free up huge amounts of load space should you have bulky items to carry. 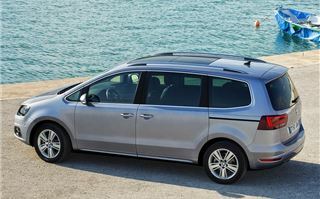 All five rear seats are fitted with ISOFIX tethers. With all seven seats in place there is 267 litres of load space, increasing to 686 with the rearmost seats folded. That’s more than enough for family gear like pushchairs, suitcases and baby bags. If you need even more space there is a huge, almost van-like 2297 litres with everything out of the way. For runs to Ikea or the rubbish dump it’s perfect. There isn’t just space for big stuff - there are plenty of little cubby holes too. The door bins are big enough for drinks and discarded kids toys, plus there is a central storage bin under the front arm rest and a nice little cubby hole on top of the dashboard for hiding things like mobile phones out of sight. If you have smaller children you’ll appreciate the Isofix mounts, as well as the optional built-in booster seats for older children. 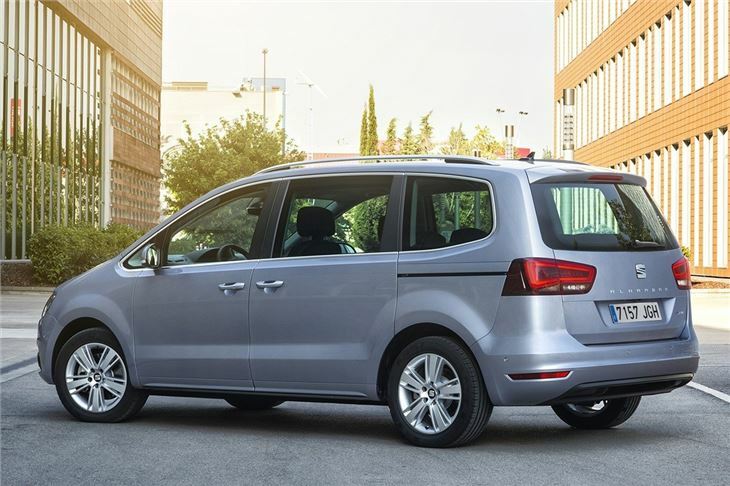 All models get alloy wheels, touchscreen and three-zone climate control, plus there are some very well-priced options including an automated parking system that takes all of the hard work out of getting what is, after all, a fairly unwieldy vehicle in tight spaces. Mid-spec SE variants are expected to be the most popular and come with high-beam assist, auto lights and wipers, cruise control and a three-pin plug for the middle row. 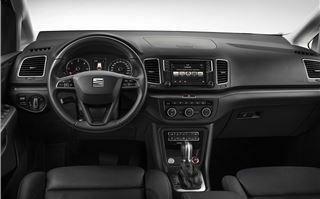 Fair enough, you might not be able to tell the difference between the new Alhambra and the old one at a glance, but SEAT had a good starting point for its updated model. The cleaner, more frugal engines should lower running costs while the updated interior and connectivity will make life easier for drivers. 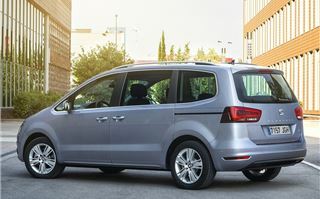 Like-for-like the almost identical Volkswagen Sharan costs around £650 more, while the basic Ford Galaxy is £1560 more than a basic Alhambra, though it is both more refined and more practical. 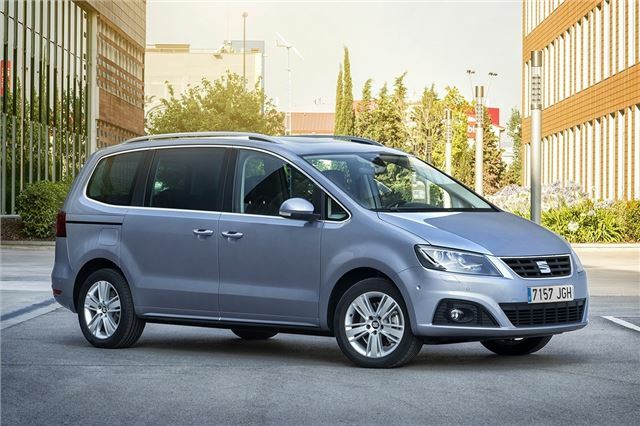 There are cheaper options, including the Citroen Grand C4 Picasso, but for a good balance of quality, space and equipment the Alhambra is a very smart buy.